Welcome to our page! 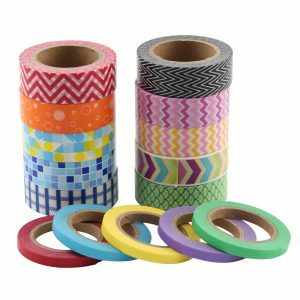 Scroll down to look at the different options of Washi tape we have. TRANSFORM & PERSONALIZE: What washi tape ideas can you come up with to change the look of your photos, notebooks, pens, phone, planner, just for a start! AWESOME VARIETY: 12 Rolls 15 mm wide and 10m in length all put together by our selectors. EASY TO WORK WITH: The product is sticky but easy to peel off and reapply. No residue will remain. Just tear off and have fun! It is currently on sale at Amazon.com for Only $10.85 !!!! AWESOME VARIETY: 10 Rolls 15 mm wide and 10m in length PLUS 5 Rolls 5mm wide and 10m in length. 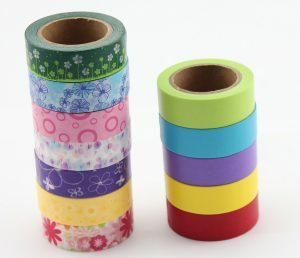 The 5mm rolls are single color rolls, great for edging, borders etc.